“The extension recognised the significant contribution Aboriginal-run health services were making to closing the health gap between Aboriginal and non-Aboriginal people. INDIGENOUS-run health services will receive a 12-month lifeline in next week’s federal budget and a further five programs will be funded until June next year at a total cost of $431 million. The Australian can reveal Health Minister Peter Dutton has approved funding of $333m for 2014-15 for the 150 National ­Aboriginal Community Controlled Health Organisations across the nation. “Many funding agreements for indigenous health programs were due to expire at the end of June. Extending the funding to June 2015 provides the continuity for these organisations to deliver important services to indigenous people over the next 12 months,” said a spokesman for Mr Dutton. The spokesman said 90 organisations funded through five specific programs — Primary Health Care, Healthy for Life, Australian Nurse Family Partnership, New Directions: Mothers and Babies and Stronger Indigenous Health Services — would get funding of $98m for another year. “This government is committed to improving indigenous health,” he said. The NACCHO welcomed the 12-month lifeline, but warned a long-term plan was desperately needed. 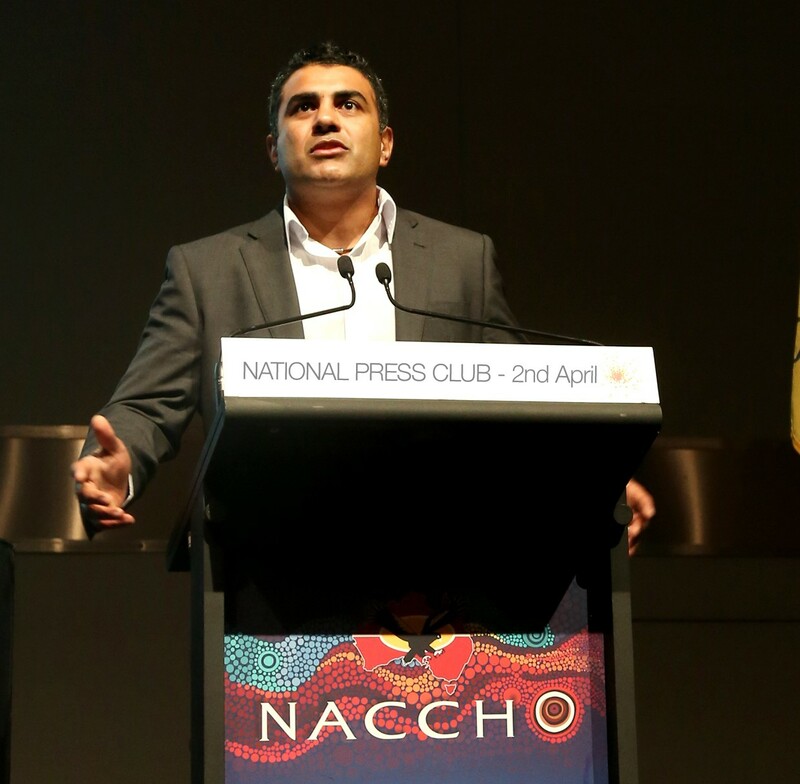 NACCHO chairman Justin Mohamed said the extension recognised the significant contribution Aboriginal-run health services were making to closing the health gap between Aboriginal and non-Aboriginal people. “This means we will be able to continue to provide high quality, culturally appropriate health care to our people for another 12 months,’’ Mr Mohamed said. He said demand for the services was increasing at a rate of more than 6 per cent a year. The importance of our NACCHO member Aboriginal community controlled health services (ACCHS) is not fully recognised by governments. The economic benefits of ACCHS has not been recognised at all. We provide employment, income and a range of broader community benefits that mainstream health services and mainstream labour markets do not. ACCHS need more financial support from government, to provide not only quality health and wellbeing services to communities, but jobs, income and broader community economic benefits. A good way of demonstrating how economically valuable ACCHS are is to showcase our success at a national summit. A report on primary health care data extracted from community controlled clinics across Queensland shows significant gains in health access and improvements, whilst demonstrating there is more work needed in coming years. The Queensland Aboriginal and Islander Health Council (QAIHC) External Report 2013 (the Report) is a clear indication that the National Close the Gap effort is working. The Report is a compilation of primary health care data collected from a number of QAIHC clinics across Queensland from 2009 to 2013. It shows that QAIHC member services are providing regular care to around 70,000 patients across Queensland. This represents close to 45 percent of the Queensland Indigenous population, an astonishing number considering QAIHC member clinics are not located in all parts of the state. Additionally, over twenty percent of the Queensland Indigenous population passed through the doors of QAIHC member services and clinics in the past six months alone. Selwyn Button, CEO, QAIHC has welcomed the Report and the timeliness of its release. “QAIHC member clinics are the largest provider of primary health care services to Indigenous people across Queensland,” Mr Button said. “This Report demonstrates that the demand for more community controlled services continue to grow throughout the state, particularly in areas where a QAIHC service is yet to be developed. “The Report is evidence that QAIHC’s services are integral in providing a much needed and significant contribution to improving the health of Indigenous Queenslanders. The Report and its statistics provide a good reminder that ongoing efforts to improve outcomes for Indigenous Queenslanders is being achieved through community controlled health services, where local people are involved in decision-making processes that effect their overall health and well-being. The Report shows that the fundamental principles of local community governance and autonomy in decision-making can make a significant difference to Indigenous health and well-being. “There is still much work to be done to improve health outcomes for Indigenous Queenslanders,” Mr Button acknowledged. “However, the foundations are now in place to support ongoing improvements, and the statistics in The Report are there as proof. 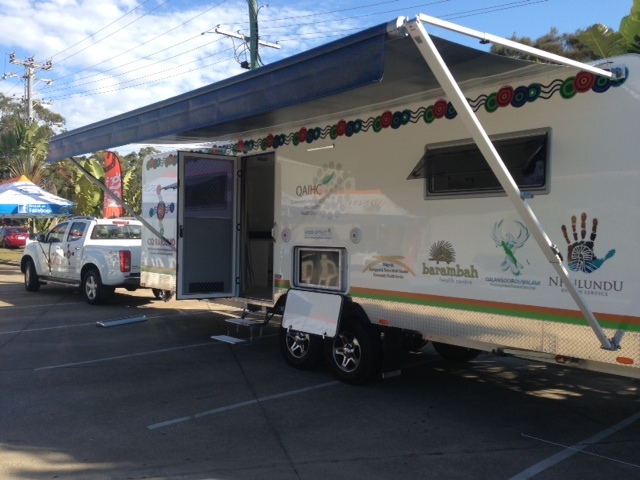 Today marks the launch of the Central Queensland Regional Aboriginal and Islander Community Controlled Health Organisation (CQ RAICCHO) mobile Health Clinic in Gladstone, funded by the Queensland Gas Company (QGC). CQ RAICCHO, a Regional Member Organisation of the Queensland Aboriginal and Islander Health Council (QAIHC), will manage this brand new Community-Controlled mobile health facility. Selwyn Button, CEO, QAIHC has today welcomed the launch of the mobile health clinic, and praised the involvement of QGC. “QAIHC and Queensland Gas Company have been working in partnership to establish a mobile health Clinic to operate across Central Queensland and Wide Bay,” Mr Button said. “Through this partnership, QGC has generously provided $425,000 to support the building, as well as the fit out of the mobile clinic, and for a vehicle to move the mobile clinic between various locations. “Free Spirit, a Queensland company based in Caloundra has built the mobile clinic to an exceptionally high standard. “Chronic disease and preventable illness account for approximately seventy per cent of the health gap between Aboriginal and Torres Strait Islanders and other Australians. “It is with this knowledge that QAIHC welcomes the involvement of a large corporate entity such as QGC in helping to address the national health priority of ‘closing the gap’ by improving access to services in rural areas for Aboriginal and Torres Strait Islander people.” Mr Button stated. “The availability of a mobile medical clinic will go a long way to addressing the health needs of Aboriginal and Torres Strait Islander people who encounter a range of barriers and obstacles affecting access to primary health care, allied health and other specialist services. “The mobile clinic will be based out of Gladstone and service three alternate routes primarily in and around the QGC operating areas,” Mr Button said. “The services will be accessible to all Indigenous people living within the scope of each route, and ongoing referral mechanisms will be established with local Regional Aboriginal and Islander Community Controlled Health Organisations. 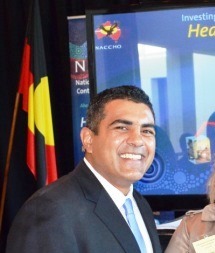 “The cooperative team effort between QGC and QAIHC demonstrates the commitment of both organisations to improving the health outcomes of Aboriginal and Torres Strait Islander people in Queensland, and provides a working example of a private and non-government sector partnership to address priority health inequities as identified in the Qld Government Blueprint for Health.” Mr Button stated.  Developing, implementing and evaluating new delivery models of comprehensive primary health care treatment, prevention and early intervention for Aboriginal and Torres Strait Islander people, families and communities in Central Queensland. The Lowitja Institute is pleased to announce the appointment of Mr Selwyn Button and Mr Justin Mohamed to its Board of Directors. Both Mr Button and Mr Mohamed bring to the board a wealth of knowledge and experience in the Aboriginal and Torres Strait Islander community controlled health sector. Mr Button is the CEO of the Queensland Aboriginal and Islander Health Council (QAIHC) and Mr Mohamed Chairperson of the National Aboriginal Community Controlled Health Organisation (NACCHO). Lowitja Institute Chairperson, Ms Pat Anderson, is delighted with the appointments. ‘We are honoured to have Selwyn and Justin join our team. Not only will they bring their considerable knowledge of the community controlled health sector, their strong leadership skills will enhance the Institute’s governance and strategic planning capacity’, said Ms Anderson. Mr Button has gratefully accepted his appointment to the Board. ‘The Lowitja Institute is Australia’s leading Aboriginal and Torres Strait Islander health research facility, and I’m privileged to be joining its Board of Directors,” Mr Button said. ‘As CEO of QAIHC, we understand the important role of research, evaluation, data analysis and knowledge translation to support improved outcomes and innovation in Indigenous health and seek to build upon the good work happening through community-controlled health services. I look at this appointment as another step towards our long-term goal to improve the health of our communities, and I look forward to the opportunity to work closely with the Lowitja Institute Board of Directors on policy and research,’ Mr Button stated. Mr Mohamed is keen to contribute his skills and experience to continue the Institute’s work to improve the lives of Australia’s First Peoples. 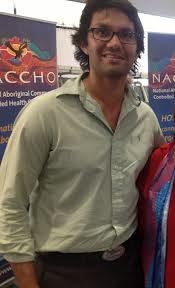 ‘As an Aboriginal person who has been actively involved in his local community and who has held positions on state, national and international working groups and committees, I am very proud to have been appointed to the board of the Lowitja Institute where I will be able to contribute towards improving the overall health and wellbeing of Aboriginal Australians,’ said Mr Mohamed. The Lowitja Institute is governed by an independent board with a majority Aboriginal and Torres Strait Islander membership. The Lowitja Institute is Australia’s only national health research organisation with a sole focus on the health and wellbeing of Australia’s First Peoples. CEOs from some of Australia’s leading eye health organisations urged the Coalition to close the gap for vision in Indigenous people at a Vision Summit in Brisbane which coincides with NAIDOC Week. More than 40 leading eye health agencies attended the Vision Summit yesterday to meet with key members of the Coalition including Peter Dutton Shadow Minister for Health and Ageing and Andrew Laming Shadow Parliamentary Secretary for Regional Health Services and Indigenous Health. Jennifer Gersbeck, CEO of Vision 2020 Australia, told the Coalition there was a significant disparity between Indigenous and non-Indigenous Australians’ eye health and more funding was needed to make Aboriginal and Torres Strait Islander eye health a priority. “Today the eye health and vision care sector called on the Coalition to commit $53.63 million* over three years to improve Indigenous eye health should they get elected at the upcoming Federal Election,” Ms Gersbeck said. “Improving coordination and referral pathways and improving accessibility to services is the key recommendation in the sector’s Indigenous eye health pre-election policy and funding proposal to closing the eye health and vision care gap over the next three years,” she said. “Uncorrected refractive error, cataract, diabetic retinopathy and trachoma are the main causes of vision loss in Aboriginal and Torres Strait Islander people,” she said. The Coalition Shadow Minister told the Vision Summit the Coalition would improve Indigenous eye health by reducing red tape, utilising expertise and working with local communities. NACCHO CEO Lisa Briggs said some 94 per cent of vision loss in Indigenous people is preventable or treatable but 35 per cent of Indigenous adults have never had an eye exam. *This figure is sought within the context of a five-year funding requirement of $90.75 million as outlined in The Roadmap to Close the Gap for Vision, 2012 (The Roadmap). This event will begin at 8-30am and will include a celebration of current Aboriginal Male Health programs at four Aboriginal Community Controlled Health Services via 10 minute presentations. The breakfast shall also include an introduction facilitated by Dr Mark Wenitong to NACCHO’s “Blueprint for Aboriginal Male Health”. Dr Mark Wenitong (left) pictured here with Cleveland Fagan Apunipima Cape York Health Council. The breakfast will conclude at 10-30am. 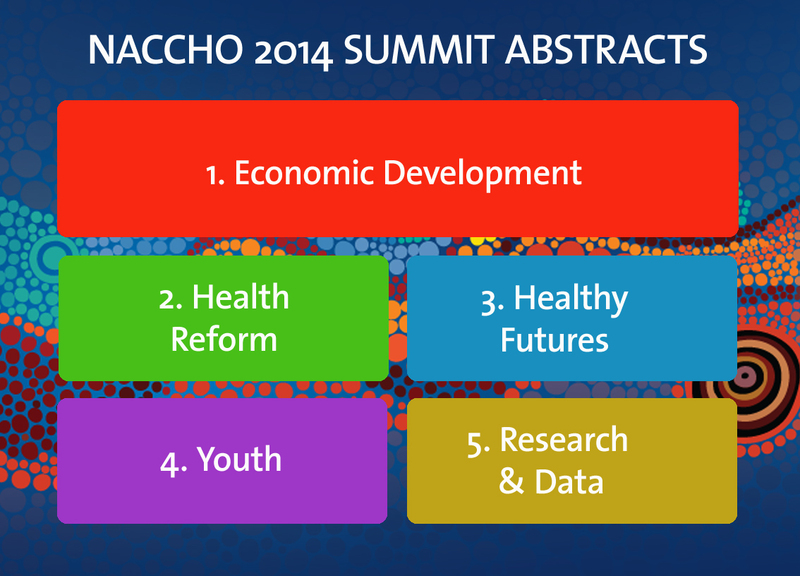 Numbers for the breakfast are limited; however priority will be given to delegates from NACCHO Members Services. YOU MUST REGISTER FOR THIS EVENT . 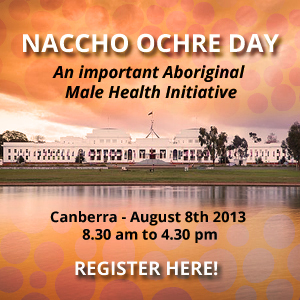 Following the breakfast, NACCHO Ochre Day will continue at Federation Mall from 11am with a celebration of achievements in Aboriginal Male health with presentations to be delivered by invited speakers. Importantly, as the focal point for the NACCHO Ochre Day the NACCHO Blueprint for Aboriginal Male Health will be launched here. The event will conclude with a “NACCHO Ochre Day Dedication Ceremony” which will include one of the largest gatherings of Aboriginal Male’s to play their didgeridoo’s in the one place at the same time. Mark Saunders, Aboriginal Male Health, NACCHO. In the United Kingdom, the NHS Institute for Innovation and Improvement encouraged its staff to explore the potential of using social media to transform care and staff engagement.3In Australia, the Indigenous health sector has been at the forefront of innovative use of social media for advocacy, public health promotion and community development. 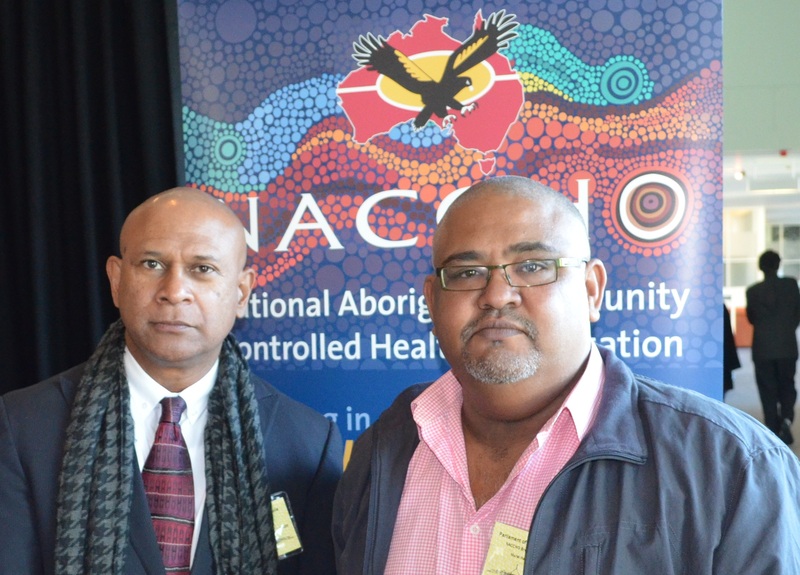 The National Aboriginal Community Controlled Health Organisation (NACCHO) was an early adopter of social media, and finds it a valuable advocacy tool, according to its Chair, Justin Mohamed. It distributes daily Aboriginal health news alerts via social media. Mohamed says downloads of NACCHO’s policy submissions have increased since they have been promoted on Twitter and other online channels. The popularity of user-generated content — a hallmark of social media — is being harnessed in new tobacco control programs. These include the No Smokes campaign from the Menzies School of Health Research and the Rewrite Your Story initiative by Nunkuwarrin Yunti (a community-controlled service). In New South Wales, the Aboriginal Health and Medical Research Council uses Facebook to promote sexual health and smoking cessation.While the digital divide is thought to be an issue relevant to remote and hard-to-reach communities,6 social media has been successfully used in the Torres Strait Islands to connect young people with a public health initiative in sexual health — the Kasa Por Yarn (“just for a chat”) campaign, funded by Queensland Health. Unpublished data show that Facebook, YouTube and text messaging were effective in reaching the target audience of 15–24-year-olds (Heather Robertson, Senior Network Project Officer, Cairns Public Health Unit, Queensland Health, personal communication). Patricia Fagan, a public health physician who oversaw the campaign, says that social media helped increase its reach.The campaign was using tools with appeal to young people, and, importantly, “it didn’t feel like health, it felt like socialising”. Heather Robertson, the project leader, says engaging local writers, musicians and actors in developing campaign messages and social media content was also important.Social media has also been used to increase engagement with the Heuristic Interactive Technology network (HITnet), which provides touch-screen kiosks in Indigenous communities and in prisons. The kiosks embed health messages in culturally based digital storytelling. Helen Travers, Director of Creative Production and Marketing for HITnet, says this has brought wider health benefits, by developing the content-creation skills of communities. “The exciting thing for health promotion is that this kind of work is increasing digital literacy and digital inclusion”, she says. Social media’s facilitation of citizen-generated movements is exemplified by the @IndigenousX Twitter account, where a different Indigenous person tweets every week, enabling many health-related discussions.Innovation in service development is also being informed by the anti-hierarchical, decentralised nature of social media. The Young and Well Cooperative Research Centre is developing virtual mental health resources for Indigenous youth in remote communities. The centre’s Chief Executive Officer, Jane Burns, envisages that these will resemble a social network more than a health care intervention, and will link young people and their health care providers with online collection of data about sleep, weight, physical activity and related measures. Burns says, “It really is . 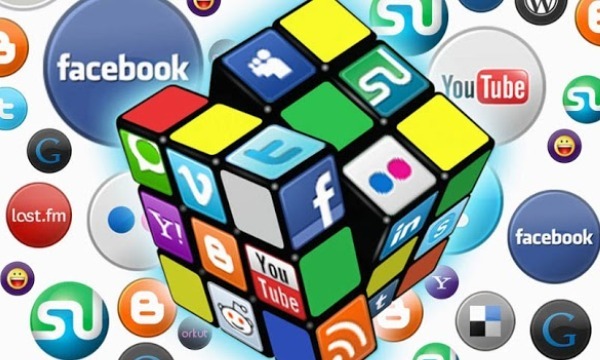 . . creating a new mental health service, a new way of doing things that empowers the individual, rather than being that top-down service delivery approach”.However, barriers to wider use of social media exist. Burns says that upskilling health professionals is critical. Kishan Kariippanon, a former paediatric physician studying social media and mobile phone use among youth in the Yirrkala community in Arnhem Land, says health professionals need support and encouragement to engage more creatively with technological innovations. He would like to see regular “hackathons” to bring together programmers, health professionals, innovators and community members to encourage “out of the box” thinking. A FILM called Mad Bastards is being used throughout Australia to inspire local indigenous men to reach their potential and become community leaders. Strong Men’s gathering of indigenous men from the Warrnambool and Moyne areas. The award-winning movie tells the story of an Aboriginal man rebuilding a relationship with his estranged son and getting his life back on track. Although it has not received widespread distribution, the movie has been received enthusiastically by men’s groups throughout Australia. It was screened this week at a Strong Men’s gathering of indigenous men from the Warrnambool and Moyne areas. The gathering at the Warrnambool Community Health Centre was addressed by Jack Bulman from the Mibbinbah men’s spaces group, who said the movie was used as an ice-breaker to stimulate discussion about how Aboriginal people could empower themselves. “The participants already know the answers, we just help them to act upon those answers,” he said. Among the issues discussed at the Warrnambool gathering were the movie’s portrayal of family violence. South West Healthcare Aboriginal health programs manager, Allan Miller, said the gathering first created “a safe place” for people to discuss sensitive issues by establishing guidelines for behaviour, such as showing respect for each other. “It’s a group decision on what happens,” Mr Miller said. The two-day gathering also provided local feedback about a national campaign being developed for Aboriginal and Torres Strait Islander men by the Prostate Cancer Foundation Australia. Mr Bulman said the gathering was a “taster” for an eight-week program for Aboriginal men that Mibbinbah hoped to later run in the region. Mibbinbah will also hold a five-day camp later this year for local Aboriginal men about building up the strength of their communities. The camp will be run in conjunction with the Gunditjmara Aboriginal Co-operative, Kirrae Health Services and South West Healthcare. The statistics are familiar and disturbing – Aboriginal people make up 2.5 per cent of Australia’s population yet account for almost a third of the number of people in prison. There are hopes that a program being trialled among prisoner inmates in Perth will help reduce the disparity. PETER LLOYD: The statistics are familiar and disturbing: Aboriginal people make up 2.5 per cent of Australia’s population, yet account for almost a third of the number of people in prison. There are hopes that a program being trialled among prisoners in Perth will help reduce the disparity. It’s based on the experiences of an Aboriginal actor and the film about his life that has become something of an underground hit. Bronwyn Herbert’s report begins with an excerpt from that film. CHARACTER 1: What’s the matter my boy, you got trouble anywhere? CHARACTER 2: Wouldn’t know where to start. BRONWYN HERBERT: The film Mad Bastards launched the career of Dean Daley-Jones. He played the role of tormented Aboriginal man TJ, in a script he helped write based on his own experiences – angry outbursts, relationship breakdowns, and time behind bars. Now he’s become a more familiar face off-screen. He’s visiting prisons right around Australia, doing time with young inmates to stop them reoffending. DEAN DALEY-JONES: You can still get your point across without thumping somebody in the head. BRONWYN HERBERT: Today he’s at a minimum security prison in Perth called Wandoo, speaking to the young men aged between 18 and 25. DEAN DALEY-JONES: Keeping your integrity and respect, and that’s one thing I’ve found, one of the greatest things I learnt through a lot of hard work, like you know, going through all that pain. BRONWYN HERBERT: The movie and its characters, who face all kinds of pressures, from drugs, alcohol and relationship breakdowns, encourages a roomful of prisoners to open up. Jack Bulman from Mibbinbah, an Aboriginal health charity based on the Gold Coast, leads the workshop. JACK BULMAN: Why did the people in Mad Bastards movie, why did they decide to make change in their lives? INMATE 1: Because of their family and friends. JACK BULMAN: Because he was worried about his family and friends. INMATE 2: And for himself as well. JACK BULMAN: And for himself as well. Beautiful. What else do we reckon? BRONWYN HERBERT: Daley-Jones’ own revelations, including his time behind bars, old drug and alcohol habits, and an explosive temper, could tell the story of many of the young men in the room. STEVEN: Dean’s sense, he said in the movie, he had a little man, with an axe, holding an axe inside of him, you know. And that’s his anger, that was his anger that he didn’t want let out, you know. I guess with me it’s just falling back into the same old habits, you know, just with drugs, using, hanging out with old friends and that. If I get away from that and just focus on my family, my daughter, I think I’ve got a good chance of, you know, making it this time. BRENDAN: Seeing the changes that TJ made in the end, it really gave me a new perspective on thinking, like, people can change. And I didn’t really believe it before and when I joined this program it really gave me insight to it, and thought oh well if he can do it, surely I can, you know? DANIEL: Made me realise that for every, like, action I take, there’s always consequences and stuff like that but I don’t know, it’s just made me look at other people’s point of views about stuff as well, and it’s not too late to try and change your life around and get back on the right path. BRONWYN HERBERT: Dean Daley-Jones says he might not have a PHD in psychology, but his 42 years of life experience is worth sharing. DEAN DALEY-JONES: If I can help one of these fellas here, I take that with me when I leave this world and that’s going to make me very happy, yeah. BRONWYN HERBERT: And that might just help these inmates realise they have the power within to break a destructive cycle. NACCHO State of Origin health news: But what’s your State of Mind? The NSW Government has joined forces with the NRL and a number of Australia’s leading mental health providers during this year’s State of Origin series to encourage people to help break down the stigma that surrounds mental illness. NSW Minister for Mental Health, Kevin Humphries, said the ‘What’s Your State of Mind’ campaign will see past and present NRL and Origin greats Mal Meninga, Jonathan Thurston, Paul Gallen, Mitchell Pearce, Greg Inglis, Roy Asotasi and Andrew Ryan urge people to take responsibility for their own mental health and encourage people to look out for one another. “The campaign has also brought together mental health service providers including beyondblue, Kids Helpline, headspace, SANE Australia, Lifeline, Black Dog Institute and MensLine Australia to encourage all Australians to take the time to improve their understanding of mental illness,” Mr Humphries said. “By having some of our best known sport stars at one of the biggest events on the Australian sporting calendar promoting mental health, this campaign is a hugely important step towards building resilience and encouraging people to support one another. The campaign will include a dedicated mental health awareness website and training for a number of NRL ambassadors to promote the campaign’s message in schools and the community. NRL Chief Executive, Dave Smith, said aligning the campaign with one of the showpieces of the Rugby League season highlighted the NRL’s commitment to combating the stigma that currently sees far too many people not seeking help when they need it. “Mental illness does not discriminate and even in a game as tough as Rugby League we are faced with mental health challenges. Our Rugby League family of players, officials, volunteers and supporters should know that it’s okay to talk to someone if you don’t feel right,” Mr Smith said. A UNIQUE trial of a smoking intervention for pregnant Aboriginal and Torres Strait Islander women is the winner of the 2013 MJA, MDA National Prize for Excellence in Medical Research, for the best research paper published in the Medical Journal of Australia in the previous calendar year. Entitled “An intensive smoking intervention for pregnant Aboriginal and Torres Strait Islander women: a randomised controlled trial”, the winning paper was authored by Sandra Eades, head of the Indigenous Maternal and Child Health Research Program at the Baker IDI Heart and Diabetes Institute in Melbourne; Rob Sanson-Fisher, Laureate Professor of Health Behaviour at the University of Newcastle; Mark Wenitong, Senior Medical Officer at the Apunipima Cape York Health Council in Cairns; Katie Panaretto, Population Health Medical Officer at the Queensland Aboriginal and Islander Health Council in Brisbane; Catherine D’Este, Professor of Biostatistics at the University of Newcastle; Conor Gilligan, lecturer at the University of Newcastle; and Jessica Stewart, a PhD student at the University of Newcastle. Smoking rates for Aboriginal and Torres Strait Islander women are high and a particular problem is the prevalence of smoking during pregnancy, which is thought to be about 50%. In this trial — the first of its kind — 263 women attending their first antenatal visit at one of three Aboriginal community-controlled health services were randomly allocated to two pathways. The intervention group was invited to participate in a program of tailored advice and ongoing support to quit smoking, delivered by a general practitioner and other health care workers. The “usual care” group received standard advice and support from the GP at scheduled antenatal visits. There was a high uptake of the intervention by the women to whom it was offered but this was a “negative study” in the sense that smoking rates remained high at 36 weeks of pregnancy — 89% in the intervention group and 95% in the usual care group — a difference that was not statistically significant. This was in some ways a disappointing outcome, especially as it came on the back of extensive background research and a unique collaboration by this group of researchers from the Baker IDI Heart and Diabetes Institute in Melbourne, the University of Newcastle, the Apunipima Cape York Health Council and the Queensland Aboriginal and Islander Health Council. However, the judges from the MJA’s Content Review Committee recognised that this research, conducted with robust and transparent methodology in a difficult real-world setting, contributes to the very important endeavour of improving the health of Aboriginal and Torres Strait Islander women and their children. Sponsored by MDA National, this prize awards the authors a cash prize of $10 000.